There are many ways that the 2015 season could have started. Few would have been more pleasant than what we got last night. I don’t think any of us had major concerns about Adam Wainwright, at least overall. However, he did have a shorter spring training than most and he’s had problems at times on the high visibility stage. Tara and I talked about it last night and agreed that it seemed like he sometimes gets too amped, too excited for the big games. That said, with experience comes maturity and this is the second opener in a row where he’s not allowed a run. Wainwright would allow leadoff runners in four of his six innings. Three of those were doubles and the one single wound up at second with a stolen base anyway. Yet Wainwright never let that bother him, working the strike zone and getting some help to keep the Cubbies off the board. You and I have as many hits with runners in scoring position as the Cubs have this year so far and much of that was Wainwright knowing exactly how to get the outs he needed. There was a lot of talk before the game about Mike Matheny running out a regular lineup, complete with lefties, to face left-handed Jon Lester. I think there were a couple of reasons for that. One, we know Matheny is all about honoring the players, giving them the chance to have an experience if they’ve earned it. It’s one reason we’ve seen him go so long with a struggling starter or be slow to take someone out of the lineup. I think Matheny wanted these guys to playing Opening Day because it was Opening Day. If Matt Adams is going to be your regular starter, he should get to be out there when they announce the lineups. Secondly, if the Cards are going to be successful this year, these lefties need to be able to step it up against those of the same persuasion. What better time than the opener to give them a crack at it? Yes, I know, a game in April means as much as a game in September. However, with a game in April, you have a lot more time to make it up than you do later in the year. Put it this way, if the Cards had lost this game and lost the division by one game, I think there would have been plenty of places to look for that extra game, not just the first game of the season. Of course, either because Matheny knew something or he lives a charmed life, the left-handed bats were critical last night. (It’s well possible Matheny knew something, as last year Lester did worse against lefties than righties.) Jason Heyward made his Cardinal debut with three straight hits, including two doubles. The second double was kinda Cub-aided, as we saw first hand last night that, no matter the star manager or the young guns coming, these Cubs still have trouble making plays. Still, Heyward couldn’t have asked for much more in his debut, scoring the first Cardinal run of the season on a Matt Holliday single and driving in the third one with a line drive past the third baseman. If Heyward has similar production against other lefties, this could be a lot of fun. Heyward also was the lead runner in a double steal, part of a night that apparently saw the club start their year-long honoring of the 1985 Cardinals. Matt Carpenter was thrown out in the Runnin’ Redbirds first attempt, but then stole four more, including that double steal. Heyward and Holliday were the pair of thieves, while Kolten Wong took second later on (and moved to third on an overthrow by David Ross) and Peter Bourjos stole third in the ninth, also moving to third on a catcher error, this time by Miguel Montero. We’ve heard them talk about stealing more and if this night is any indication, they may be serious about it. That said, Lester (whom everyone but Bourjos swiped their bag against) is becoming legendary for not throwing over to first and that makes it much easier. We’ll see if they have the same amount of success or try quite as much when there’s a pitcher better against the running game on the mound. If you are new to this blog, first of all, welcome, and second of all let me explain my hook here. Every game I pick the Hero and the Goat of the game. There are many different things that go into this selection, but basically it’s my opinion, as there are no real hard and fast rules. (When there’s a tie, a bad game by the leadoff batter usually weighs more since that impacts the rest of the lineup so much, but that’s about it.) Last night, I’m going to go with Adam Wainwright as the Hero, just because his ability to work out of a jam (even though they were of his making) was pretty impressive and if he stumbles once, that game could be different. Heyward was a close runner-up on that one. The Goat will go to Matt Adams, as much as I hate to do it. Adams was the only starter not to reach base last night and he struck out twice, leaving five men on. That said, at least in his first at-bat against Lester he looked pretty good, extending the at-bat and fouling off some pitches before striking out. It would have been nice to see him break through, but he was in a tough position last night. Hopefully he’ll have a better game on Tuesday. Also, once a week we are going to try to showcase the work of Twitter @Cardinal_50 here. We did this some last year as well after I found him Tweeting out some really nice-looking scorecards after games. He’s allowed us to feature them here and I appreciate his willingness, because these are some nice looking scorebooks! Click on them to see them in all their glory. 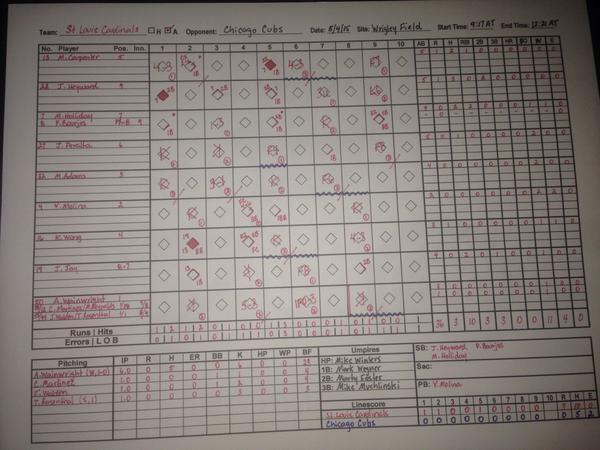 The Cardinals’ work last night, courtesy of Cardinal_50. 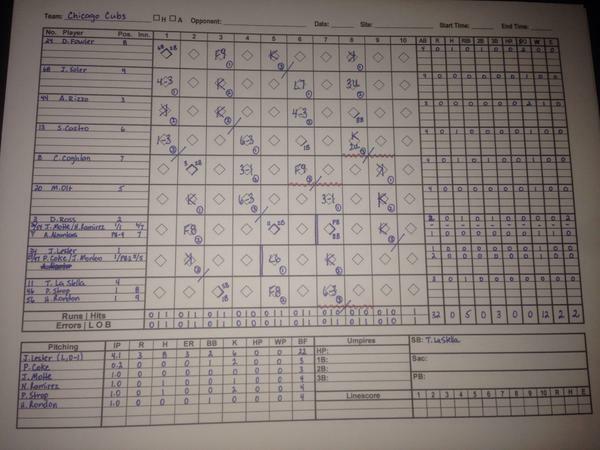 The Cubs’ work on Opening Night, care of Cardinal_50. The Cardinals, right now, are quantifiably the best team in baseball. The only team with a win, they get to sit back and enjoy the first day of the season before getting back at it Tuesday night. It’s nice to know that we’re the only fanbase that’s 1-0 for a few hours, isn’t it? When they do play again, they’ll face Arrieta, as noted above. Arrieta was extremely tough on St. Louis last year, facing them four times and limiting them to a .183/.272/.207 line while putting up a 1.21 ERA. The last time they saw him, September 24th, he gave up two hits in seven innings, striking out 10. So it’s not like they figured him out while the season went along. Which means this preview chart isn’t going to be pretty. Jhonny Peralta and Adams have done OK against him, but a couple of the Matts are still looking for their first base knock versus Arrieta in more than 10 ABs. Maybe Arrieta won’t be on the top of his game, but the Cards have their work cut out for them. Going for the Redbirds is Lance Lynn. Lynn took the next step last year, shaking off his “Lynning” tag and putting up the finest season he’s had so far. Rewarded with a contract extension during the winter, Lynn looks to keep that going against a Cubs team that he only faced once last year, giving up two runs in six innings back on May 4th. (It’s a little surprising, given the amount of games these two teams play against each other, he only saw them once. Quirk in the schedule, I guess.) In his career, he’s had mixed success against the baby bears. It’s nice that he’s been able to handle Anthony Rizzo and I don’t expect he’ll see much of Welington Castillo, so this could be another pitcher’s duel. Then again, with this pitching staff, almost every game could be a pitcher’s duel, at least until we see if the offense comes around. Enjoy the off-day! I hope you have a chance to watch some other baseball. If you’ve got MLB.tv, you can feast all day. I think some like DirecTV are running free previews of MLB Extra Innings, so maybe you can see some baseball that way as well. Baseball is back!